X Factor boy band One Direction have announced a tour of the UK in 2013. The group will play 13 dates starting at London's O2 Arena next February. They will also perform in Glasgow, Cardiff, Belfast, Manchester, Liverpool, Sheffield, Nottingham, Birmingham and Newcastle. One Direction beat off competition from the likes of Adele, Ed Sheeran, JLS, Olly Murs and Jessie J to take the best single prize at this year's Brit Awards in a public vote. The band is made up of Harry Styles, Zayn Malik, Liam Payne, Niall Horan and Louis Tomlinson. They came third in the seventh series of The X Factor in 2010 behind Rebecca Ferguson and winner Matt Cardle. 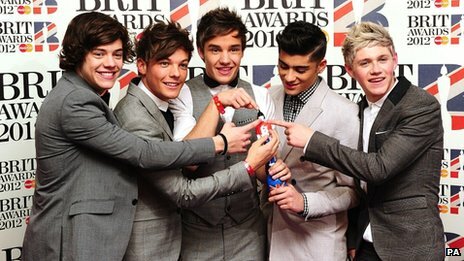 After winning their first Brit, 18-year-old Harry Styles said: "We really did not expect to win. The category had Adele and Ed Sheeran [in it]. "For us to be considered among those artists is massive for us. To win just shows how good our fans are. "They're the best fans in the world. They are amazing and we love them." Their record label boss Simon Cowell tweeted to congratulate the band. He said: "Fantastic news. Congrats @onedirection I am very proud of you." What Makes You Beautiful was released in September last year, taking the number one spot in the singles chart and having the highest first-week sales of the year selling 153,000 copies in seven days. The group finished their first UK tour last month and are touring in America and Australia during 2012. Tickets go on sale at 9am on Saturday 25 February.